Make sure you’re not searching for it. If you already know where it is, you don’t need Google (or any other search engine). 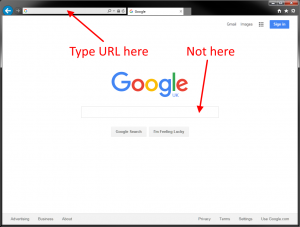 Make sure you’re typing the web address directly into the URL bar at the top of your browser. Make sure you’ve typed it in correctly. Mistakes are easily made, so try typing it in again exactly as it’s written on the leaflet. Make sure you’re connected to the internet. If you’re reading this page, it’s likely you’re connected to the internet, but it’s worth checking a few other websites too to make sure it’s definitely only our website that you can’t get to. Still can’t find us? There may be a temporary technical problem at our end stopping the site from loading. Try again later, and if it’s still not working then contact us and let us know.